From the time that I stepped off my plane in San Antonio to the time I boarded my plane to leave, my ears and eyes were constantly hearing and reading one phrase: “Viva Fiesta!” This makes sense, since I was at Fiesta, the biggest party that San Antonio throws every year. 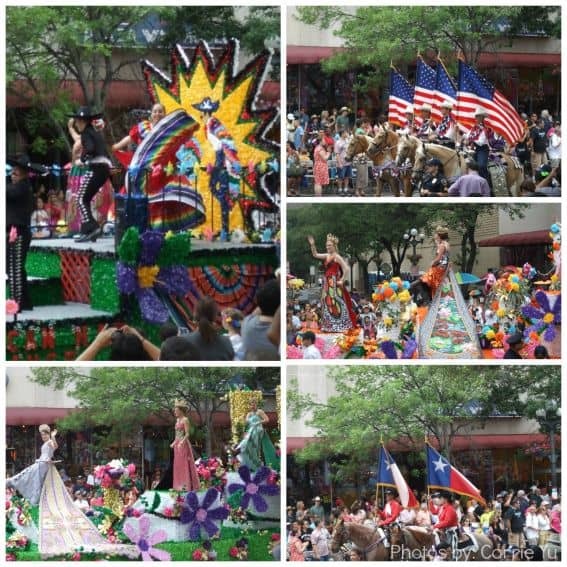 Fiesta occurs every April, for a ten-day period that falls before and after the anniversary of the Battle of San Jacinto- the battle that gained Texas its independence from Mexico. 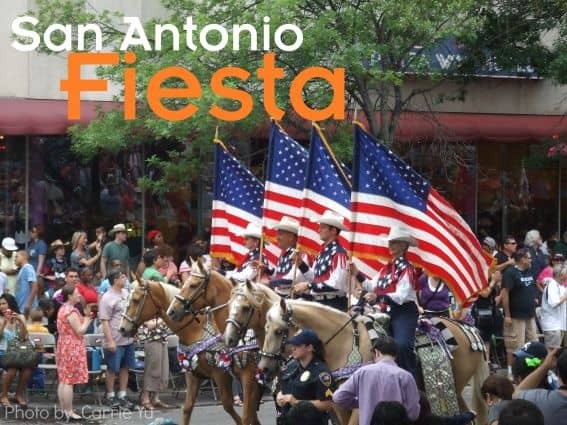 Fiesta is an amazing, family-friendly, city-wide party that includes concerts, dances, music festivals, and of course, parades -14 of them, to be exact! Many of the parades are relatively small, but three of the parades, the Fiesta Flambeau, the River Parade, and the Battle of the Flowers are a seriously big deal. The Battle of the Flowers is so big that schools and businesses close the day of the parade. No one wants to miss out! This parade has been going on since 1891 and features marching bands, military groups, horseback riders, floats, and Fiesta Duchesses in gowns so fancy that they take two years to complete! Each of the organizations represented in this parade donate a wreath in honor of the fallen Alamo soldiers. While your visiting San Antonio, why not explore the Alamo? There are several traditions associated with Fiesta that add an extra element of fun to the festivities. I was introduced to the first tradition- cascarones– soon after my arrival in San Antonio. As I stood and chatted with some friends, I suddenly was enveloped in a shower of confetti! Cascarones are real eggshells that have been emptied of eggs and filled with confetti. During Fiesta, these eggs are everywhere, and everyone takes great joy in breaking them over the heads of friends and strangers alike. Everyone wears a coat of confetti during Fiesta! Another great Fiesta tradition that is enjoyed by kids and adults alike is medal collecting. Organizations, businesses, and families that are involved in Fiesta make small medals that are handed out at Fiesta events. You can collect them and see how many you get by the end of Fiesta, and you can even trade pins with other people! I had a great time collecting medals- I had 11 by the end of my time in San Antonio, but really dedicated collectors have ten times that or more! Fiesta has a constant background noise of medals jingling as everyone collects and wears the medals around the city. When a break was needed from the crowds and Fiesta craziness, we enjoyed escaping to several of the local museums for more subdued Fiesta fun. Both the Institute of Texan Cultures and the Witte Museum have special exhibits related to Fiesta, in addition to their regular fabulous exhibits. These museums are very family-friendly and worth visiting any time of year! 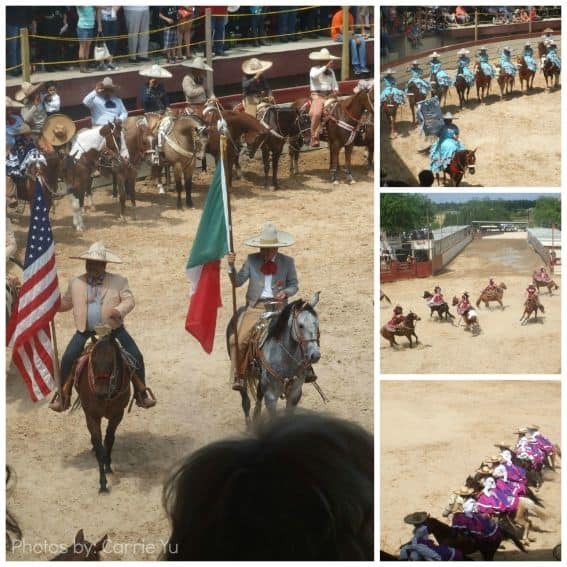 Attending the Charreada at Charro Ranch was an experience unlike any I’ve ever had before. After climbing a flight of stairs and entering a horseshoe-shaped arena full of cheering crowds, the entertainment began. The parade began and the area below our seats was filled with horsemen wearing sombreros and women riding side saddle and wearing billowy, fluffy, vibrantly colored dresses. This show takes place throughout the year, but since this show occurred at the end of Fiesta, the parade was joined by the King and Queen of Fiesta, and many of the other Fiesta royalty were in attendance. And talk about family-friendly, during the parade portion of the show, several of the riders carried small children on their laps! After the parade, it was time for the excitement. The cowboys took turns showing off their roping and riding skills, which were impressive. But then the women entered in their teams of eight and blew us away with their performances of the Escaramuza, which can only be described as ballet on horseback. Did I mention they were on sidesaddle while doing all their fancy maneuvers! Most of the announcer’s narrative of the event was in Spanish, and there was a mariachi band that performed throughout the event. I kept forgetting I was still in the United States! What a fun afternoon outing. Another great escape from Fiesta is San Antonio’s famous River Walk. This amazing treasure of a pathway now stretches 15 miles, all the way from the city to the historic Spanish colonial missions on the outskirts of town. San Antonio is a city full of diverse cultures, great food, and friendly people. Visit whenever you can, but be sure to mark your calendar for Fiesta 2014, April 17-27, 2014. Your family will have a great time! Thanks to the San Antonio Convention and Visitors Bureau for hosting me on my visit to San Antonio.